It’s no secret that recruiters and potential bosses are scouring the internet to check out potential candidates, but what can feel like a secret is figuring out what they want to see. 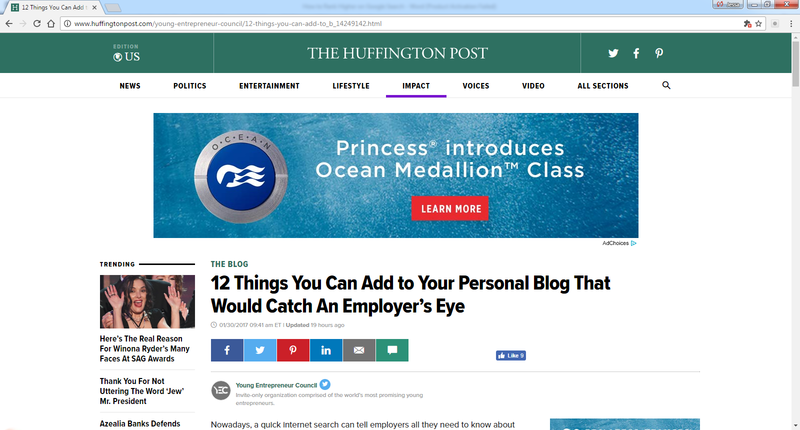 The Huffington Post asked me and other hiring managers what would catch our eye in the right way if we found a candidate’s blog. I want to see a visual resume page, which candidates can easily direct you to in the application process. One particular candidate had a page filled with visual representations of his work from the past decade. There were links to mentions, a video and reviews. I’ve gone on to hire more people who took a similar approach. It tells you so much more about a candidate than any CV can. Other hiring managers want to see a blog that highlights how a candidate gives back. Matching personality with the culture of a company has become increasingly important, and a candidate who gives back showcases they have the right personality for any team. Add a personal touch, and stay consistent, too.